Another year of trick-or-treating has come and gone. This year I took the girls around and Ryan stayed home to pass out treats to the neighbors. Usually I stay home and he goes with the kids. The weather was great-warm enough to only need a bit of a jacket, so there were lots of kids of all ages out and about. Anya was a fairy princess. Sierra was Elizabeth Swann from Pirates of the Caribbean (although she hasn't seen any of the movies and mostly just thought the costume was pretty). Emma was a Southern Belle (think Scarlett O'Hara). 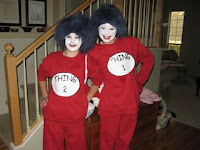 Lexi and her friend Madeline were Thing One and Thing Two. Christa went with two of her friends as a fork, knife and spoon. She was the knife. I didn't get her picture.